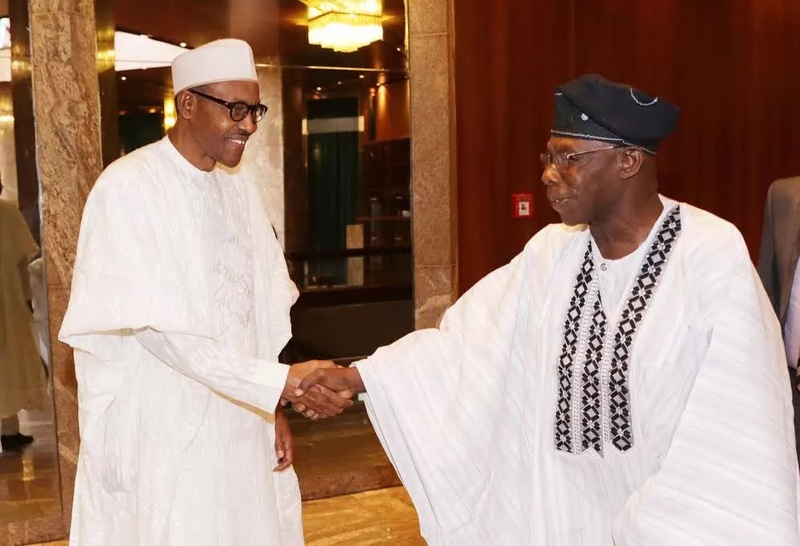 Former President Olusegun Obasanjo spoke yesterday on the state of the economy.He urged President Muhammadu Buhari to urgently fix things “because Nigerians are suffering”. The former President denounced the National Assembly as a cesspool of corruption and some of the lawmakers as “unarmed robbers” who are defrauding the nation . “If we do not fix the economy to relieve the pain and anguish of many Nigerians, the gain in fighting insurgency and corruption will pale into insignificance. No administration can or should be comfortable with excruciating pain of debilitating and crushing economy. “Businesses are closing, jobs are being lost and people are suffering. I know that President Buhari has always expressed concern for the plight of the common people but that concern must be translated to workable and result-oriented socio-economic policy and programme that will turn the economy round at the shortest time possible. “We cannot continue to do the same thing and expect things to change. That will be a miracle which normally doesn’t happen in normal national economies. Obasanjo said: “If corruption is continued to be fought courageously and relentlessly, there will be substantial recovery from within and from without, coupled with plugging the holes of wastes in Ministries, Departments, Educational Institutions and parastatals and we will need less borrowing, if we would need borrowing at all, to get us out of recession than we might have thought. “ Of course, we must be ready to bite the bullet of spending less on luxuries and the unneeded and what we can do without and earning more on production, services and trading. “I believe that going for a huge loan under any guise is inadvisable and it will amount to going the line of soft option, which will come to haunt us in future. We immediately need loans to stabilise our foreign reserve and embark on some infrastructure development but surely not $30 billion over a period of less than three years. Obasanjo supported the ongoing clean-up of the Judiciary and the trial of some judges which he described as inevitable. “Three weeks before the first three judges were arrested for corruption, I was talking to a fairly senior retired public officer who put things this way, ‘The Judiciary is gone, the National Assembly is gone, the military is sunk and the civil service was gone before them; God save Nigeria’. I said a loud Amen. Three weeks later, the process of saving the Judiciary began. “And if what I have gathered is anything to go by, there may be not less than two score of judicial officers that may have questions to answer. That will be salutary for the Judiciary and for the Nation. “While one would not feel unconcerned for the method used, one should also ask if there was an alternative. “ A drastic action was needed to save the situation, albeit one would have preferred an alternative that would serve the same purpose, if there was one. In the absence of that alternative, we must all thank God for giving the President the wisdom, courage and audacity for giving the security agencies the leeway to act. There is virtually no corrupt Judge without being aided by a member of the bar. The Nigerian Bar Association, NBA, has the responsibility to clean up its own house and help with the cleaning of the Judiciary. “The National Assembly stinks and stinks to high heavens. It needs to be purged. With appropriate measures, the budget of the National Assembly can be brought down to less than 50% of what it is today. God will help Nigeria, but we must begin by helping ourselves. “The National Assembly cabal of today is worse than any cabal that anybody may find anywhere in our national governance system at any time. “Members of the National Assembly pay themselves allowances for staff and offices they do not have or maintain. Once you are a member, you are co-opted and your mouth is stuffed with rottenness and corruption that you cannot opt out as you go home with not less than N15 million a month for a Senator and N10 million a month for a member of the House of Representatives. “The National Assembly is a den of corruption by a gang of unarmed robbers. “Another means by which the National Assembly embarks on corruption spree is their so-called oversight responsibility. They instigate and collude with Ministries, Departments, Parastatals and Agencies to add to their budget outside what was submitted by the President with the purpose of sharing the addition or they threaten such units to reduce what was submitted by the President unless there is a promise of kickback. “By our Constitution, the Revenue Mobilisation, Fiscal and Allocation Commission should be responsible for fixing the remunerations of the Executive and the Legislative arms of the government. Any salary, allowance or perquisite not recommended by the Commission should not be budgeted for; but crooks and crocked that most of the members of the National Assembly are, they will try to find other ways which must be blocked. “In the past, they even instructed the Clerk of the National Assembly not to reveal to the Executive details of their remuneration. May God give the President the wisdom, courage and audacity to be able to do with the National Assembly what is being done with the Judiciary. “We should not continue to live with the impunity and corruption of the National Assembly. He also criticised the idea of lumping together the three administrations of the Peoples Democratic Party (PDP) – his own President Umaru Yar’Adua’s and President Goodluck Jonathan’s of the last 16 years and tarring them with the same brush. Obasanjo indicated that his own administration stood out.